The Maillard reaction is a chemical reaction occurring between a reducing sugar and an amino acid, generally requiring thermal processing. Maillard reaction products (MRPs) have antioxidant, antimutagenic, and antibacterial effects though 2,4-bis (p-hydroxyphenyl)-2-butenal (HPB242), a fructose-tyrosine MRP, appears to inhibit proliferation of cancer cells, its mechanism of action has not been studied in detail. The purpose of this study was to investigate the anti-proliferative effects of 2,4-bis (p-hydroxyphenyl)-2-butenal (HPB242) on two oral squamous cell carcinoma (OSCC) cell lines, HN22 and HSC4, through regulation of specificity protein 1 (Sp1). HPB242 treatment dramatically reduced the cell growth rate and apoptotic cell morphologies. Sp1 was significantly inhibited by HPB242 in a dose-dependent manner. Furthermore, cell cycle regulating proteins and anti-apoptotic proteins, which are known as Sp1 target genes, were altered at the molecular levels. The key important regulators in the cell cycle such as p27 were increased, whereas cell proliferation- and survival-related proteins such as cyclin D1, myeloid leukemia sequence 1 (Mcl-1) and survivin were significantly decreased by HPB242 or suppressed Sp1 levels, however pro-apoptotic proteins caspase3 and PARP were cleaved in HN22 and HSC4. HPB242 may be useful as a chemotherapeutic agent for OSCC for the purpose of treatment and prevention of oral cancer and for the improvement of clinical outcomes. Oral squamous cell carcinoma (OSCC) is a common type of malignant tumor. New cases of oral cancer occur at around 275,000 patients, and OSCCs cases comprise approximately >90% of diagnosed patients with oral cancer . Although conservative treatments of oral cancer, including surgery, radiation and chemotherapy, have well advanced to date, the five-year survival rate still remains to be less than 50% . Oral cancer is a serious health problem in many parts of the world and is the eighth-leading cause of cancer-related death in men. Certain studies have proposed that some of the risk factors for oral cancer are tobacco, alcohol, ultraviolet light and oral lesions . Although the occurrence of oral cancer is low, the development of more effective therapeutic strategies for the prevention and treatment of oral cancer is imperative. Several studies have reported that novel plant-derived compounds act as antitumor agents through modulation of biological pathways . Maillard Reaction Products (MRPs) such as Glucose-tyrosine (Glu-Tyr) and Xylose-arginine (Xyl-Arg) have antioxidant, antimutagenic, and antibacterial effects [5, 6] and the MR is one of the most common and complex reactions that takes place mainly in foods during thermal processing . Also many studies have reported beneficial effects associated with maillard reaction products, including antioxidative [8–10] antimicrobial, antihypertensive, anticarcinogenic, and antimutagenic properties [10–12]. However, to date, little is known about other biological effects of MRPs. In this study, we examined whether the fructose-tyrosine MRP, HPB242, could modulate cell cycle progression and Specificity protein (Sp) repression, and thus induce apoptotic cell death of OSCCs. Sp is a transcription factor and universally expressed in all mammalian cells . Specificity protein 1 (Sp1) was recently defined as the Sp/krűppel-like transcription factor  and was identified to play a significant role in various physiological processes such as cell cycle regulation, apoptosis and angiogenesis [15–18]. Furthermore, Sp1 is highly expressed in various cancers such as breast carcinoma, thyroid cancer, hepatocellular carcinoma, pancreatic cancer, colorectal cancer, gastric cancer, cervical cancer and lung cancer [16, 18–21]. Regarding its cancer-related functions, Sp1 has been suggested to be a novel target for cancer therapy. 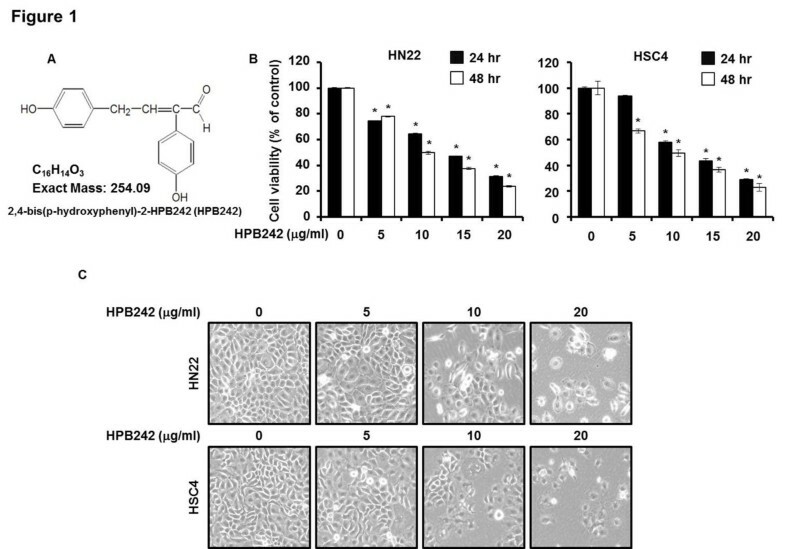 To characterize the effect of 2,4-bis (p-hydroxyphenyl)-2-butenal (HPB242) on OSCCs, this study specifically examined the anti-cancer effect of HPB242 on cell viability against two oral squamous cell carcinoma cell lines, HN22 and HSC4, and identified regulated proteins by HPB242 treatment in the cells. In this study, we investigated whether downstream proteins of Sp1 protein and key apoptotic proteins could be affected in their expression toward apoptotic cell death through alteration of Sp1 expression by HPB242 treatment. Our results provide evidence for the chemotherapeutic efficacy of HPB242 in oral squamous cells. HN22 and HSC4 cells, a type of human oral squamous cancer cells, were obtained from Dankook University (Cheonan) and Hokkaido University (Hokkaido) respectively. HN22 and HSC4 were cultured in Hyclone Dulbecco’s modified Eagle’s medium (DMEM) containing 10% heat-inactivated fetal bovine serum and 100U/ml each of penicillin and streptomycin at 37°C with 5% CO2 in humidified air. Cell viability of HN22 and HSC4 cells was accessed using the trypan blue dye exclusion method [22, 23]. Briefly, both HN22 and HSC4 cells were seeded on a 6-well microtiter plate (5 × 104 cells/well), after which they were treated with different doses of 5, 10, 15 and 20 μg/ml HPB242 for 24 hours and 48 hours. The HN22 and HSC4 cells treated with HPB242 were harvested by trypsinization and washed in cultured media. Trypan blue (0.4%) was added to treated cells, and after 5 min, cells were loaded into a hemocytometer and counted. The number of viable cells was calculated as percent of the total cell population. The number of undergoing apoptotic cells by HPB242 was quantified using 4′-6-diamidino-2-phenylindole (DAPI) staining. Nuclear condensation and fragmentation were determined by DAPI stained nucleic acid. After 48 hours post-treatment of the agent with different doses (HPB242; 5, 10, and 20 μg/ml), HN22 and HSC4 cells were harvested by trypsinization, washed with cold phosphate buffered saline (PBS), and fixed in 100% methanol at room temperature for 20 minutes. The cells were spread on a slide and then stained with DAPI (2 μg/ml), and subsequently monitored by a FluoView confocal laser microscope (Fluoview FV10i, Olympus Corporation, Tokyo). After 48 hours of HPB242 treatment in HN22 and HSC4 cells, the cells were washed with cold PBS, pooled and centrifuged before being fixed in 70% ice-cold ethanol overnight at -20°C, and then treated with 150 μg/ml RNase A and 20 μg/ml propidium iodide (PI; Sigma-Aldrich, Inc. St. Louis, Missouri). The stained cells were analyzed, and the distribution of the cells in different phases of the cell cycle was calculated using flow cytometry with a MACSQuant Analyzer (Miltenyi Biotec GmbH, Bergisch Gladbach). Total RNA was extracted from the cells using TRIzol® Reagent (Life Technologies, Carlsbad, California), and 2 μg of RNA was used to synthesize cDNA using the HelixCript™ 1st-strand cDNA synthesis kit (NanoHelix, Korea). cDNA was obtained by PCR using β-actin-specific and Sp1-specific primers as described below under following PCR conditions (35 cycles: 1 min at 95°C, 1 min at 56°C, and 1 min at 72°C). The β-actin primers used were; forward 5′ GTG GGG CGC CCC AGG CAC CA 3′ and reverse 5′ CTC CTT AAT GTC ACG CAC GAT TTC 3′; and the Sp1 primers were; forward 5′ ATG CCT AAT ATT CAG TAT CAA GTA 3′ and reverse 5′ CCC TGA GGT GAC AGG CTG TGA 3′. PCR products were analyzed by 1% agarose gel electrophoresis. Total cell lysate was prepared using PRO-PREP™ Protein Extraction Solution (iNtRON Biotechnology, Korea) containing 1 μg/ml aprotinin, 1 μg/ml leupeptin, and 1 mM PMSF. Fifty micrograms of total protein was separated via 10 or 15% (v/v) SDS-polyacrylamide gel electrophoresis and then transferred onto polyvinylidene difluoride (PVDF) membranes. After blocking for two hours at room temperature with 5% non-fat dried milk in PBST containing 0.1% tween-20, the membranes were immunoblotted with specific primary antibodies against Sp1 (1C6), p27 (C-19), Cyclin D1 (M-20) (Santa Cruz Biotechnology, Santa Cruz, CA), PARP (BD Biosciences, San Diego, CA), Mcl-1, Survivin, Cleaved-caspase3, anti-Bid, anti-Bax, anti-Bcl-xl (Cell Signaling, Danvers, MA) and β-actin (AC-74) (Sigma-Aldrich) overnight at 4°C. After washing with PBST, secondary antibodies to IgG (Santa Cruz Biotechnology) conjugated with horseradish peroxidase were used, and chemiluminescence signals were enhanced with the Pierce ECL Western Blotting Substrate (Thermo scientific, Rockford) according to the manufacturer’s instructions. The cells were seeded over each sterilized glass coverslips on six-well tissue culture plates for 24 hours and incubated with HPB242 for 48 hours. The cells were fixed and permeabilized with Cytofix/cytoperm solution for 30 min. For Sp1 and Cleaved-caspase3 expression, the cells were blocked with 1% BSA and then incubated with monoclonal Sp1 and Cleaved-caspase3 antibody at 4°C overnight. After washing with PBST solution, the Sp1 and Cleaved-caspase3 antibody was reacted with a Jackson 488- and 647-conjugated anti-mouse secondary antibody at room temperature for 1 h and then mounted with Mountin solution-VECTSHIELD mounting medium for fluorescence with DAPI (Vector Laboratories, Inc. Burlingame, CA) onto the cells. The cells were visualized using a FluoView confocal laser microscope. Data are reported as the mean ± SD of at least three independent experiments. Statistical significance was evaluated using Student’s t-test. Compared to the vehicle control, p < 0.05 were considered significant. To determine the effect of HPB242 on the cell viability of two OSCCs, HN22 and HSC4, we confirmed the growth inhibitory potential by trypan blue assay. The results indicated that HPB242 decreased the viability of HN22 and HSC4 cells in a dose-and time-dependent for 24 and 48 hours (Figure 1B). The IC50 value of HPB242 for 48 hours of incubation was estimated as 9.96 μg/ml in HN22 and 9.85 μg/ml in HSC4 cells, respectively. The cell viabilities of HN22 were shown as 78 ± 0.3%, 49.8 ± 1.2%, 37.5 ± 0.8%, and 23.8 ± 0.5% at 5, 10, 15, and 20 μg/ml of HPB242, respectively, compared with untreated control cells when viabilities were calculated at 48 hours post-treatment. In the case of HSC4, viabilities were measured as 66.7 ± 0.9%, 49.5 ± 0.5, 36.7 ± 0.6%, and 22.9 ± 1.0% at 5, 10, 15, and 20 μg/ml of HPB242, respectively, compared to that of untreated control cells when viabilities were calculated at 48 hours post-treatment. Apoptosis-induced changes in the cell morphology in the HPB242-containing medium were observed. After 48 hours, the apoptotic phenotype showed cell rounding, cytoplasmic blebbing and irregularities in shape, indicating a sharp increase in the apoptosis of HPB242-treated HN22 and HSC4 cells in a concentration-dependent manner (Figure 1C). The effect of HPB242 on cell viability of oral cancer cells. (A) Chemical structure of HPB242. (B) The cell viability effect of HPB242 on HN22 and HSC4 cells. HN22 cells (2 × 103 cells/well) and HSC4 (3 × 103 cells/well) cells were seeded in 96-well plates and incubated for 24 hours and 48 hours with increasing concentrations of HPB242 in 10% FBS-DMEM. Cell viability was estimated using the trypan blue dye exclusion method, as described under Methods. Results are indicated as cell viability relative to the untreated HPB242, and data are represented as means ± SD from three independent experiments. The asterisk indicates a significant difference compared to the negative control (untreated cells) (*p < 0.05). (C) Morphological changes observed in the HPB242 treated (5, 10, and 20 μg/ml) or untreated HN22 and HSC4 cells 48 hours post-treatment. The effect of HPB242 treatment on initiation was due to the induction of apoptotic cell death by nuclear morphology using DAPI staining, which allowed visualization of nuclear shrinkage and fragmentation. 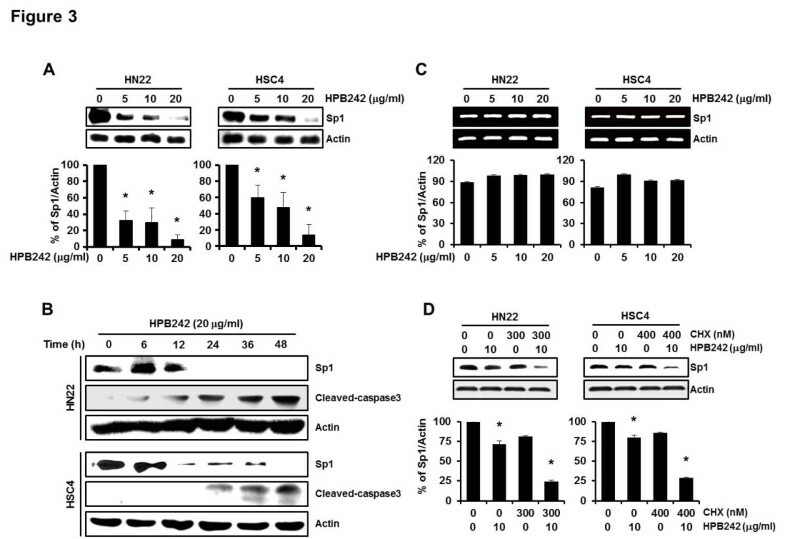 HPB242 treatment of HN22 and HSC4 cells led to an increase in nuclear condensation and fragmentation compared to the control group (Figure 2A, B). In order to determine whether Sub-G1 population induction by HPB242 is related to apoptosis, HPB242 treated cells were marked with PI staining. When HN22 and HSC4 cells were treated with HPB242, an increased number of cells in the Sub-G1 population was observed in 3.6 - 34% of HPB242-treated HN22 cells and in 5.6 – 30.4% of HPB242-treated HSC4 cells (Figure 2C, D). The apoptotic effect induced by HPB242 in HN22 and HSC4 cells. Cells were incubated with HPB242 (5, 10, and 20 μg/ml) and untreated for 48 hours. The cells were harvested and prepared for DAPI staining and PI staining as described in the Methods section. (A) Analysis of DNA fragmentation and nuclear condensation by fluorescence microscopy (magnification ×600) after HPB242 treatment in HN22 and HSC4 cells. (B) DNA fragmentation and nuclear condensation were quantified, and the results in triplicate are expressed as the mean ± SD. (C and D) Representative histograms of Sub-G1 population. HPB242-treated cells were compared with untreated cells, and data are shown as the average of triplicate samples from three independent experiments. The asterisks (*) indicates p < 0.05 versus control cells. Several studies have recognized that the expression levels of transcription factor Sp1 dramatically increases during transformation, representing a critical effect in tumor development or maintenance. The effects of HPB242 treatment on Sp1 levels were inspected by western blotting. As shown in Figure 3A, HPB242 treatment led to a sharp decrease in the level of Sp1 in HN22 and HSC4 cells at 48 hours after treatment. In order to characterize the apoptotic action of HPB242, we confirmed expression levels of Cleaved-caspase3 by western blotting (Figure 3B). However, Sp1 mRNA levels did not suppressed by HPB242 in both HN22 and HSC4 cells (Figure 3C). 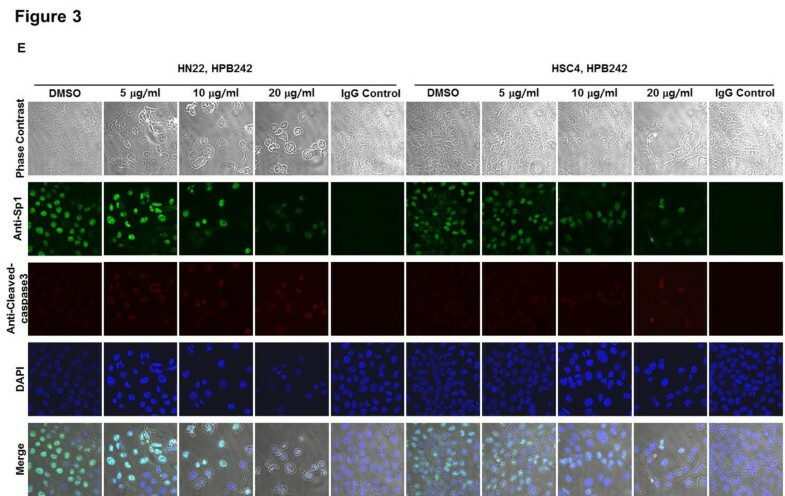 When CHX-pretreated HN22 and HSC4 cells were incubated with HPB242, degradation of Sp1 protein by HPB242 was additionally enhanced (Figure 3D). There were increases in Cleaved-caspase3 following HPB242 (20 μg/ml) treatment of HN22 and HSC4 cells in a time-dependent manner. According to these observations, immunocytochemical results also showed decreased levels of Sp1 positive cells in a dose-dependent manner in HN22 and HSC4 cells (Figure 3E). HPB242 also cell cycle arrest-related proteins such as p27 were increased, whereas cell proliferation- and survival-related proteins such as cyclin D1, Mcl-1 and survivin were significantly decreased (Figure 4A, B). These results collectively suggest that down-regulation of Sp1 by HPB242 treatment could lead to apoptotic cell death. The effect of HPB242 on specificity protein 1 (Sp1) protein expression in HN22 and HSC4 cells. HN22 and HSC4 cells were incubated with different concentrations of HPB242 for 48 hours. The cells were harvested and prepared for western blots as described under Methods. Protein expression levels of Sp1 were detected using a specific antibody against Sp1, and its levels were quantified after actin normalization. (A) The HPB242-treated cells were compared with untreated cells, and data are shown as the means ± SD of three independent experiments. The asterisk indicates a significant difference compared with the negative control (untreated cells) (*p < 0.05). (B) Time-dependent effects of HPB242 on Sp1 and Cleaved-caspase3 expression were performed in HN22 and HSC4 cells for 48 hours with 6 hours intervals. (C) The effect of HPB242 (0–20 μg/ml) for 48 hours on Sp1 mRNA expression was determined by RT-PCR. The graphs indicate the ratio of Sp1 to β-actin expression. (D) The effect of HPB242 on Sp1 protein turnover in HN22 and HSC4 cells. The protein lysates were obtained from cells pretreated with protein synthesis inhibitor such as cycloheximide (CHX) for 2 hour and then exposed to HPB242 for 48 hours. The protein expression of Sp1 was analyzed by western blot analysis. (E) Immunocytochemistry analysis was performed in HPB242 treated HN22 and HSC4 cells. HN22 and HSC4 cells were treated with different concentrations of HPB242 for 48 hours, and cells were immunostained with Sp1 specific antibody, Cleaved-caspase3 specific antibody, and then signals were detected with Jackson 488- and 647-conjugated anti-mouse secondary antibody. DAPI was used for nucleus staining. 254×190 mm (96 × 96 DPI). The effect of HPB242 on downstream target proteins by the specificity protein 1 (Sp1). HN22 (A) and HSC4 (B) cells were incubated with HPB242 (0, 5, 10 and 20 μg/ml) for 48 h. The effect of HPB242 for 48 hours on p27, Cyclin D1, Mcl-1, and Survivin was determined by Western blots. Fifty micrograms of cellular extract per lane was separated on an SDS-PAGE gel as described in Methods. Equal loading of protein was confirmed by incubating the same membrane with anti-β-Actin antibody. Treatment of cells with HPB242 regulates the expression levels of various apoptotic proteins (Figure 5A, B). An immunoblotting technique was used to analyze the levels of several pro- and anti-apoptotic proteins to determine whether treatment with HPB242 regulates the expression of apoptosis-related proteins in HN22 and HSC4 cells. Activated Bid, PARP, and Bcl-xl were decreased and Bax, Cleaved-PARP and Cleaved-caspase3 increased in HPB242-treated HN22 and HSC4 cells. The effect of HPB242 on apoptosis of HN22 and HSC4 cells. HN22 (A) and HSC4 (B) cells were incubated with HPB242 (0, 5, 10 and 20 μg/ml) for 48 h. Fifty micrograms of cellular extract per lane was separated on an SDS-PAGE gel as described in Methods. Immunoblot detection of Bid, Cleaved-caspase3, and PARP, upregulation of Bax, downregulation of Bcl-xl in whole cell lysates from various concentration HPB242-treated HN22 and HSC4 cells for 48 hours. Equal loading of protein was confirmed by incubating the same membrane with anti-β-Actin antibody. MRPs such as Glu-Tyr and Xyl-Arg have antioxidant, antimutagenic, and antibacterial effects . Although HPB242, a fructose-tyrosine MRP, appears to inhibit proliferation of cancer cells, its mechanism of action has not been studied in detail. In this study, our findings along with the findings of previous research, HPB242 may induce apoptosis in OSCCs. In the present study, the apoptotic effects of HPB242 on HN22 and HSC4 cells were investigated through the trypan blue dye exclusion method. This assay, a traditional method for discovering anticancer drugs, can be used to determine the cytotoxic effect and proliferation of cell lines [25, 26]. In this study, this assay was used to elucidate the apoptotic effects of HPB242 on HN22 and HSC4 cells (Figure 1). As shown in Figure 2, HPB242 inhibited the proliferation of HN22 and HSC4 cells through cell cycle arrest at G0/G1 and induction of apoptosis. Transcription factor Sp1 is known to be regulated by molecular target genes in various biological processes including differentiation, metabolism, cell growth, angiogenesis and apoptosis . Therefore, Sp1 protein levels are expected to be a negative prognostic factor and a potential therapeutic target for cancer chemotherapy . As shown in Figure 3A, B, treatment with HPB242 induced a significant decrease in the protein expression levels of Sp1 in the HN22 and HSC4 cells in a dose- and time-dependent manner. However, Sp1 mRNA did not suppressed by HPB242 in both HN22 and HSC4 cells (Figure 3C). 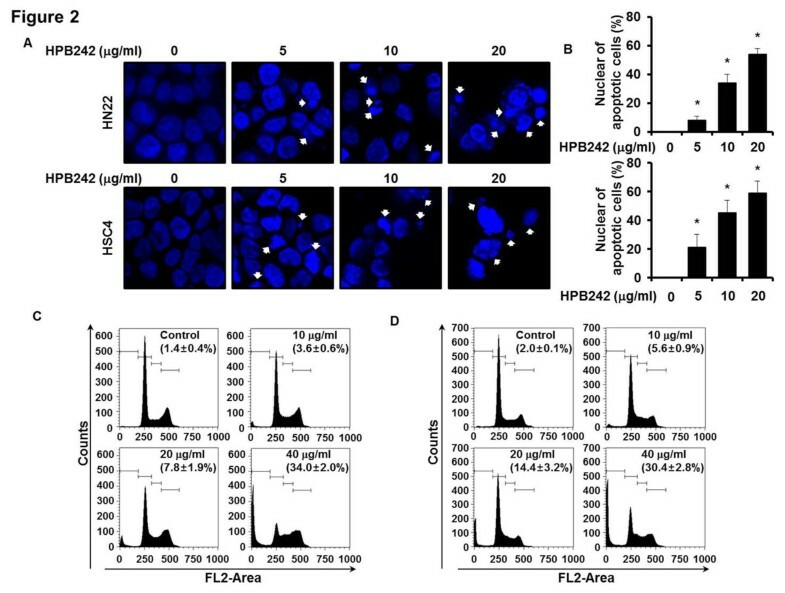 When CHX-pretreated HN22 and HSC4 cells were incubated with HPB242, degradation of Sp1 protein by HPB242 was additionally enhanced (Figure 3D). Immunocytochemistry results also revealed a decreased level of Sp1 and an increased level of Cleaved-caspase3 in a dose-dependent manner in the HN22 and HSC4 cell lines (Figure 3E). Our results confirmed that HPB242 induced nuclear condensation and apoptosis of HN22 and HSC4 cells and inhibit the expression of Sp1 and Sp1 regulatory proteins. In a previous study, HPB242 inhibited cell viability and induced apoptotic cell death in HN22 and HSC4 cells . In addition, HPB242 inhibited the transcriptional activity and expression of Sp1 downstream proteins, including p27, Cyclin D1, Mcl-1 and Survivin, in a dose-dependent manner (Figure 4). HPB242 reduced Bid and Bcl-xl, increased Bax, and activated Caspase3 and PARP, suggesting that HPB242 regulates Sp1 and ultimately leads to apoptotic cell death (Figure 5). Our results demonstrate Sp1 could serve as an efficient therapeutic target of cancer. Sp1 expression levels increase during transformation, which can play a critical role in tumor development or maintenance. Although Sp1 deregulation is beneficial for treating tumor cells, it is reported that overexpression of Sp1 induces apoptosis of untransformed cells or cancer cells . To further confirm whether HPB242 could modulate anti-apoptotic protein expression toward apoptosis, we observed alterations of Mcl-1 and Survivin when cells were treated with different doses. Mcl-1, Survivin and cell cycle regulatory proteins were greatly reduced by HPB242 treatment in a dose dependent manner (Figure 4). Thus, HPB242 can be said to positively regulate p27 and negatively regulate Cyclin D1, Mcl-1 and Survivin in OSCCs, resulting in activation of a caspase-dependent apoptosis pathway through Cleaved-caspase3 and PARP (Figure 5). In this study, we investigated the cancer chemoprevention effect of HPB242 on OSCCs. Our results revealed that HPB242 has cell growth inhibitory activity and induces apoptosis in OSCCs through inhibition of Sp1 expression. Taken together, clinical studies with HPB242 are necessary to explain its unexpected potential toxicity and clinical applications. OSCC was influenced by the chemotherapeutic effects of HPB242. We suggest that HPB242 regulate Sp1 target proteins, resulting in apoptosis by the suppression of Sp1 levels in HN22 and HSC4 cells. Sp1 can be used as an effective therapeutic target in cancer research, and HPB242 are potential cancer drugs or adjuvants as chemotherapeutic agents for OSCC. Jung-Il Chae, RaHam Lee contributed equally to this work. This research was supported by Basic Science Research program through the National Research Foundation Korea (NRF) Funded by the Ministry of Education, Science and Technology (2011–0008463) and the Agenda Program (No. PJ00932102) from Rural Development Administration, Republic of Korea. J-HS designed research and wrote the manuscript. J-IC, RHL and JHJ carried out research experiments and analyzed data. JTH and J-IC participated in the design and performance of this study. All authors read and approved the final manuscript.